The 30-odd people inside the Sauber Formula One team’s pit garage at the Buddh International Circuit in Greater Noida look unearthly in the glacial white glow of overhead lights. A crack team of mechanics and engineers, dressed in Sauber’s silver-white overalls, headphones on their ears, stand in attention while waiting for the team’s race engineers to give them the signal for a pit stop. Apart from the deafening scream of cars passing by behind the pit wall that separates the track from the pit lane, there is complete silence inside the garage. Three-member teams will change each tyre (one taking off the old tyre, one operating the pneumatic gun to unfasten and fasten the wheel nut, and one putting on the new tyre); two men, one in the back and one in the front of the car, will operate the jacks to lift the car up; one man will carry a fire extinguisher, and the “lollipop man" will keep watch on the crew and signal the car to go once the job is done. When Kobayashi comes in, the crew huddles around the car, changes the wheels, checks for junk and damage, and steps back. The car zooms off. The whole operation is over in 3.5 seconds. The pit garage and its crew can make or break an F1 driver’s race. 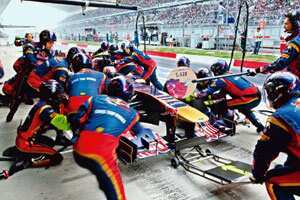 A millisecond off during the pit stop, a failure to spot damage or debris, an inability to set up the car to operate at its maximum potential and optimum driver comfort, and the race is effectively over. No surprise then that the F1 pit garage is populated with some of the best mechanics and automobile engineers in the world, people who go through intense and rigorous practice, data-crunching and fine-tuning their skills so they can spot the slightest discrepancy in the car or its running during a race, or perform operations that will take hours in an ordinary garage in just a few seconds. Bal Sira, the 31-year-old second mechanic for Sebastian Vettel, Red Bull Racing’s world champion driver, who won the inaugural Grand Prix of India on the weekend, laughs when asked how long an ordinary set of mechanics would take to do a pit stop. “How long do you think you will take?" he asks, smiling. “We can jack up the car and change all four wheels in 2.2, maybe 2.5, seconds." That’s about half the time it takes for the average person to punch in a 10-digit mobile number they know by heart. Sira and his fellow mechanics and engineers also have the longest working hours during a race weekend, working 12-13 hours each day on an average. “On Friday (practice day), we got here at 7.15am, and finished work only at 1.30am on Saturday morning," Sira says. He was back in the garage at 8am on Saturday, went in straight for a half-hour pit-stop practice, and then began preparing the car immediately after that—which involves taking the car apart, then conducting a complicated series of checks, analysis, fine-tuning and taking measurements, before finally putting the car back together for the qualifying session. During the qualifying round, Sira doubles up as the left front tyre man in the pit-stop crew. “We do a set-down after the session is finished," Sira says. “We measure all the angles of the wheels, the ride heights, we check for any damage or broken parts, then we remove the gearbox, then we remove the engine, and take apart the car." At 3.30pm, he rushes into Red Bull Racing’s hospitality area for this interview, tries to shovel in a few mouthfuls of food at the same time, and 10 minutes of rapid talking and eating later, he is back inside the garage. This time, he and his crew will be reassembling the car, putting in new radiators, oilpipes and brakes. They will refit the gearbox, fire up the engine with an external starter to run it, take measurements, complete the bodywork and then take the car to the Fédération Internationale de l’Automobile (FIA) “patch" for scrutiny. “What you need in a pit crew is someone who can work in a team, is competent, trustworthy and fast —they don’t give you long to change the parts, do they?" Sira says. “You need to be quick, and do it right." Formula One cars feature more than 6,000 custom-made components, a majority of which the mechanics will take apart and put back together in less than 10 minutes many times over the course of the race weekend. During the practice session just before the qualifying rounds, Team Lotus driver Jarno Trulli’s car is inside the garage, hooked up to snaking cables coming out of the overhead gantry. Mechanics quietly work around the car as Trulli watches track information on a screen docked to the front of the car. Trulli’s teammate Heikki Kovalainen is already out for his practice drive. Kovalainen’s race engineer keeps up a running commentary on the team radio—“We’ll adjust the wing to 15 degrees, 15 degrees." “You can keep pushing Heikki, your time is good." “Heikki says not to change the brake balance." Each driver in F1 has his own race engineer, who is the only one who can communicate with the driver when the driver is on the track. “It’s the most important relationship in the team, the driver and the race engineer, and they probably see more of each other than of their wives!" says Karun Chandhok, Team Lotus’ Indian driver. Apart from the feedback from the driver himself, an F1 car is equipped with over 100 sensors, which relay real-time information from the car’s various components back to the garage. Hundreds of varieties of data is generated, compared and analysed, the results used to make infinitesimal changes in the car’s set-up. Just like the race, everything is extremely precise, fast and perfectly efficient—the F1 pit garage is part air-traffic control, and part operating theatre. Neither of these comparisons is fanciful. England’s NATS (National Air Traffic Services) is currently working with the McLaren F1 team’s engineers to map Heathrow’s air traffic using the same software used during F1 races. McLaren’s pit-stop crews worked with the Great Ormond Street hospital in London a few years back to help make the handover between surgery and intensive care more efficient, creating brand new hospital protocols. 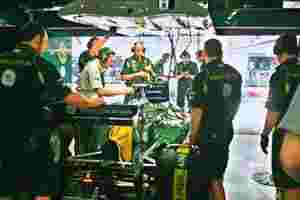 “Nothing funny happens in a pit garage," says Team Lotus manager Thomas Watson. “It’s all very serious, it must all run to precision."